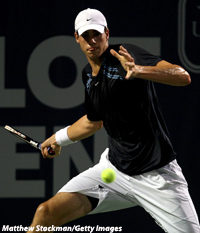 NEW HAVEN, Conn. (AP) -- American rookie John Isner waited through nine hours of rain, then beat Benjamin Becker 6-3, 6-4 in 57 minutes Tuesday night in the first round of the Pilot Pen. Fan favorite James Blake, who grew up in nearby Fairfield, also won his first match in straight sets, 6-4, 6-2, over Arnaud Clement of France in front of a rowdy group of fans known as the "J-Block'' who showed up for the late match, despite the weather. Blake, who lost in the finals Sunday in Cincinnati to Roger Federer, said he likes the way he's playing heading into the US Open next week. "I feel like I'm playing better than in 2005, when I won here,'' he said. Isner, the 6-foot-9 former University of Georgia standout had 14 aces, and was seldom in danger of being broken by the much smaller (5-10) German. Isner had only two breaks of his own, going up 3-1 in the first set and 2-1 in the second, and seemed content after those to rely on his service game. His serve, which topped out at 132 mph on a damp night with temperatures in the mid 50s, drew several "oohs'' and "aahs'' from the crowd. So did a volley in the final game, when Isner stretched his entire length at the net to reach what appeared to be a clear passing shot. Isner and Becker were originally scheduled to play Monday night, but that match was rescheduled to Tuesday morning, and then rescheduled again when rain wiped out the entire day session. That included Lindsay Davenport's return to professional tennis. Her doubles match was bumped to Wednesday. Davenport gave birth to her first child in June and has not played since last September. Davenport and doubles partner Lisa Raymond were rescheduled to play Cara Black and Liezel Huber on Wednesday afternoon, and the match was moved to the grandstand court, so that Isner could play at the same time on stadium court against David Ferrer. Isner, who made it to the finals in Washington earlier this month, is playing in just his fourth ATP tournament. In the women's draw Tuesday night, Sania Mirza of India beat Anabel Medina Gerrigues of Spain 6-3, 6-3 in a match that had been suspended after one game Monday because of the weather. Mirza said the delay seemed to help her. "I was actually not feeling very well yesterday, so maybe it was a blessing in disguise that the rain came down,'' she said.